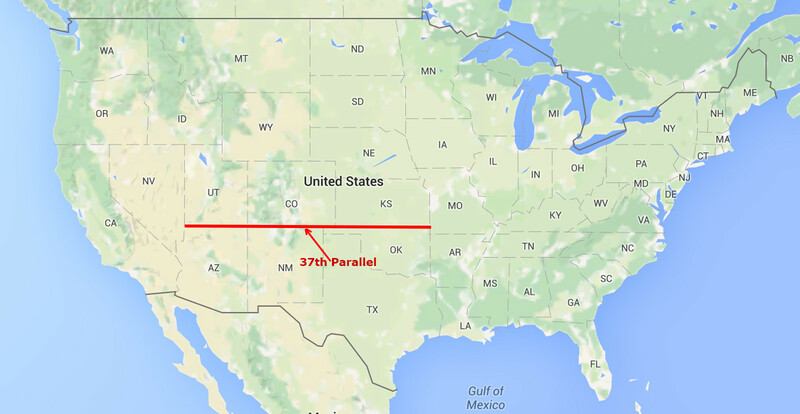 The 37th Parallel. Across the middle of the US lies a 1209 mile long borderline, the longest straight line on the US map (not counting the US-Canada border, of course). It’s a vast strip extending from the verdant east to the arid west, now populated by oil and gas wells, pivot irrigators, cattle, few people, and a couple of dramatic landmarks. What’s noteworthy is the graphic boldness of the line itself, at least for anyone staring at the US map. So… why now should we bother with this line to nowhere? Purpose of this project. The intention here is to travel along this line, reflecting on the mid-nineteenth century politics that created it while looking at the landscape that presents itself today. The elegant and powerful line, as perceived then, is hard to imagine when gazing at the extensive prairies and deserts upon which it was placed. The line was difficult as well for the surveyors charged with documenting its location. We’ll take a look at the challenge of reconciling the abstract concept of the latitude line with establishing surveyors’ benchmarks on the landscape. The borders, as we’ll come to see, only occasionally coincide with the 37th parallel. Origin of the line. The line runs between Nevada and Missouri, separating Arizona from Utah, Colorado from New Mexico, and Oklahoma from Colorado and Kansas. The brainchild of a pre-Civil War Congress, the line divided the vast mid-continent prairie and desert regions into geometric zones with little thought to the area’s inhabitants or geography, about which little was known in Washington. We can imagine Senator Stephen A. Douglas dipping his pen into an inkwell and drawing a straight line across a clean almost-blank map of the newly-acquired Far West. Jefferson’s 1784 concept of applying grid-like boundaries to the wilderness— to provide order to the unknown— became the principal tool for implementing political decisions for the great western expansion in the 19th century. After 1848, when vast territory was acquired from Mexico, a new problem arose: how would all those millions of acres affect the precarious political balance of the Missouri Compromise? The mid-nineteenth century senator-cartographers quickly understood two looming problems: first, since territories would eventually become states, they wanted to make the territories as large as possible since eventually each of these units would send two senators to Washington, and incumbent senators knew their power would become diluted by too many new states. Secondly, new states would upset the Missouri compromise unless they were admitted in the same free/slave pairs that had controlled statehood since 1820. To resolve gridlock over territorial organization and keep the political scales balanced, senators established a long border along the 37th parallel above which territories would be organized as slave-free, while those below the line would permit slavery to be expanded. The line thus represents a continuation of the Missouri Compromise. But two months before the first survey began (May 15, 1857) the subsequently infamous Dred Scott decision mooted this premise, asserting that Congress had no authority to declare the northern part of the Louisiana Purchase to be slave free. Other methods for defining boundaries– around watersheds, for example as suggested by John Wesley Powell in 1879, were never seriously entertained. Once drawn the line was never modified.